As expected, the Hat has been retained. It just wasn’t as easy as expected. On Saturday afternoon, Northwestern (8-4, 8-1 B1G) defeated Illinois (4-8, 2-7 B1G) to win the Land of Lincoln trophy in the regular season finale and the Wildcats’ last home game of the year. Due to Ohio State’s 62-39 romp of Michigan in The Game, Northwestern will now prepare to face the Buckeyes in the Big Ten Championship game next Saturday in Indianapolis. Pat Fitzgerald opted to play this game conservatively, preferring the risk of a close game to the risk of losing a key player to injury or suspension. Notably, the Wildcats’ top receiver, Flynn Nagel, was out, and despite not being on the injury report, top LB Nate Hall did not play a snap. The Fighting Illini started the game with a long drive into NU territory. QB A.J. Bush was finding his groove before an offensive pass interference on 3rd and 4 killed the drive. 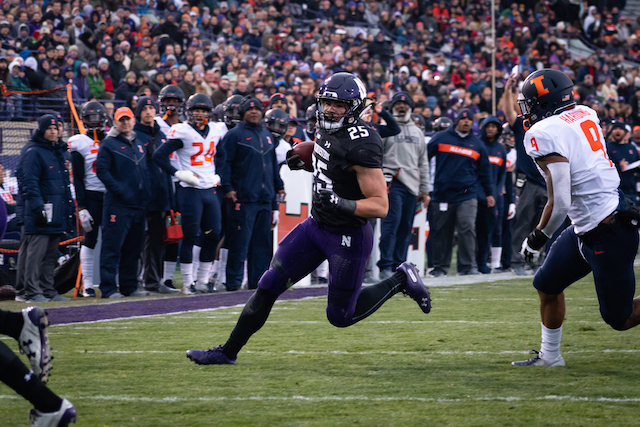 Northwestern took over, and on their first offensive play, Isaiah Bowser exploded for a 55-yard run to the Illinois 37. The ‘Cats would rely on Bowser (18 attempts, 166 yards) all game, and will certainly need the freshman to find success against Ohio State if they hope to win. A short drive later, Thorson found Bennett Skowronek for an 8-yard touchdown to put Northwestern on the board. The catch was Skowronek’s only of the game, but his second go-ahead touchdown in three weeks. For his part, Thorson (12-17, 110 yards, 2 TDs) again played a relatively small role in the win. The last several weeks have demonstrated that the Wildcats’ winning formula is a punishing rushing attack and a stout defense, and Thorson has been just fine with taking a step back. The senior’s last start at Ryan Field was also his 51st consecutive start dating back to his redshirt freshman year, the most ever by a Big Ten quarterback. Two long Illinois drives resulting in short field goals from the foot of Chase McLaughlin sandwiched a Northwestern 3-and-out and make the game 7-6. However, the ‘Cats followed that up by methodically driving down the field and scoring on a 1-yard sneak from Thorson. He now has 8 rushing TDs on the season and 25 in his career. However, Thorson still ended with -2 rushing yards on the day, bringing him to a bizarre -101 for the season. After quickly getting the ball back, Northwestern put together its most efficient drive of the day, going 80 yards on 9 plays and finding the endzone on a 5-yard Thorson strike to Riley Lees. The highlight of the drive was this 25-yard reception by Ramaud Chiaokhiao-Bowman after taking a big hit. The concentration. The flip. The grassy helmet. Illinois's defense held strong in the second half, as the Wildcats couldn't put up any more points after their first drive of the third quarter. Bowser was taken out after Northwestern's first possession, and the 'Cats couldn't find a groove behind Solomon Vault, who finished with a measly seven yards off five carries. Thorson left the game at the end of the 3rd quarter, with Northwestern taking a comfortable 24-6 lead into the 4th. The Fighting Illini's long dormant offense revived in the 4th, as Bush undertrhew a 10-yard strike to Ricky Smalling, who adjusted in midair, bobbled the pass, and secured it in the end zone. Illinois forced a 3-and-out on Northwestern's next possession, and Bush led the Illini into the red zone down 24-16 with a chance to tie the game with around four minutes remaining. Just when Fitz' gamble to take out his starters on offense appeared at risk, linebacker Paddy Fisher picked off Bush to clinch the victory. 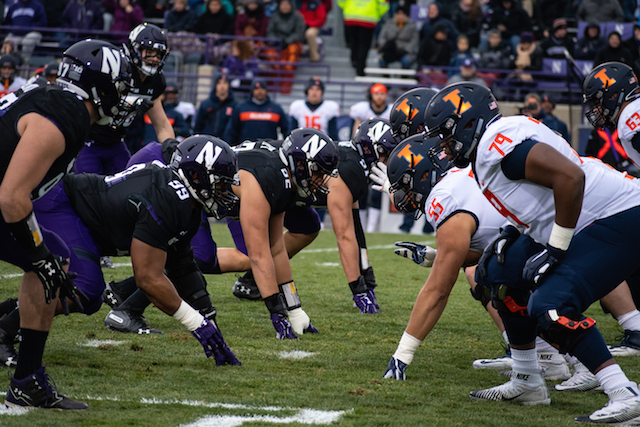 Although Northwestern eventually prevailed against the Illini, the shaky second half performance combined with key injuries to three quarters of the defensive backfield leaves the 'Cats desperately in need of a turnaround performance against Ohio State's vaunted offense, which put up 62 points against what was previously the nation's top ranked defense. For now, though, Wildcat faithful should bask in the glow of the Land of Lincoln Trophy and the performance of a senior class that has never lost to their rivals down south.